Former Junior Team USA members Katelyn Simpson of Emmett, Idaho, and Mary Wells of Johnstown, Ohio, paired up to take the Diamond Doubles lead at the 2017 United States Bowling Congress Women’s Championships on May 25 with a 1,378 total. Simpson (right), a 22-year-old right-hander, led the doubles effort at the Raising Cane’s River Center with a 732 series, while Wells, also a 22-year-old right-hander, added 646. Melissa Van Dyke of Parma, Ohio, and Heidi Sanders of Xenia, Ohio, previously held the lead with 1,332. Simpson and Wells spent time together on Junior Team USA in 2015, bowled collegiately at Pikeville and Central Missouri, respectively, and recently competed at the USBC Queens at the River Center prior to their doubles run. 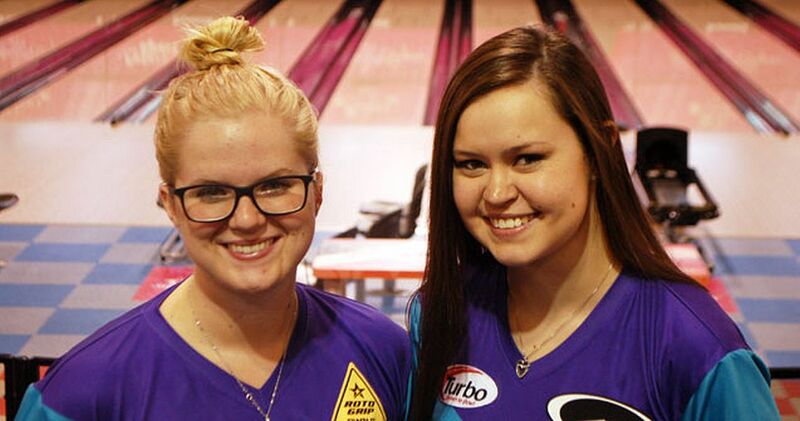 Both players noted that even with their success in youth and collegiate bowling, being the leaders at the USBC Women’s Championships is the biggest thrill in their young careers. Diamond Doubles includes duos with combined entering averages of 380 and above. Two bowlers are scheduled to make their 50th USBC Women’s Championships appearances this week in Baton Rouge. Jo Anne Elischer of Portage, Indiana, will make her 50th consecutive tournament appearance May 26, and Marion Saunders of Waynesville, Missouri, will make her milestone trip May 29. Elischer, 70, started her tournament career at the 1968 event in San Antonio and finished in second place in Classic Team at the 1971 event in Atlanta. Saunders, 84, made her first appearance at the 1953 Women’s Championships in Detroit, and despite not attending 11 of the next 12 years, she has been a dedicated participant since 1966. For more information on the Women’s Championships, click here. 98th USBC Women’s Championships underway in Baton Rouge, La. 1, The Big Ticket 1 (Kayla Bandy, Michelle Smith, Daphne Smith, Jennifer King), Columbia, S.C., 2,650. 2, Strike Out Diabetes, O’Fallon, Ill., 2,618. 3, Four Fun, Saugerties, N.Y., 2,497. 4, Storm Nation, Brigham City, Utah, 2,463. 5, Bowlieve, O’Fallon, Ill., 2,459. 1, Chevrolet of Helena (Peggy Cloninger, Jenny Chambers, Kimberly Bolan, Danielle Bolan), Helena, Mont., 2,105. 2, Cashmere Bowling Queens 1, Charlotte, N.C., 2,077. 3, Garden Center Lanes 1, Alexandria, Minn., 2.052. 4, TTC Ladies 1, Alta Loma, Calif., 2,043. 5(tie), Great Balls of Fire, Buffalo Grove, Ill., and Two Bar Bowl, Cheyenne, Wyo., 2,035. 1, The Rose Buds (Mary Rose, Lee Joslyn, Edna Prall, Debbie Bugg), Danville, Ky., 1,961. 2, Friendly Mixers, Villa Park, Ill., 1,911. 3, Ninth Avenue Salon, Windom, Minn., 1,889. 4(tie), New Jersey Bad Girls, Egg Harbor Township, N.J., and Bermuda Gold 1, Bermuda, 1,887. 1, Mixed Up Nuts, (Sabrina Ravndal, Shelley Nolan, Christine Ravndal, Laura Baker), Helena, Mont., 1,854. 2, Jadene’s Team, North Adams, Mass., 1,785. 3, Pickups, Carlisle, Pa., 1,763. 4, Clean Up Crew, Fruitland, Wash., 1,755. 5, Nifty Over Fifty, Independence, Kan., 1,747. 1, Mary Wells, Johnstown, Ohio/Katelyn Simpson, Emmett, Idaho, 1,378. 2, Heidi Sanders, Xenia, Ohio/Melissa Van Dyke, Parma, Ohio, 1,332. 3, Hayley Veitch, Kenner, La./Aumi Guerra, Dominican Republic, 1,319. 4, Sydney Brummett, Fort Wayne, Ind./Elysia Current, Brigham City, Utah, 1,307. 5, Lindsay Boomershine, Brigham City, Utah/Kristie Leong, Daly City, Calif., 1,289. 1, Peggy Monson, Rolling Meadows, Ill./Judy Shaver, Streamwood, Ill., 1,129. 2, Shirley Smith, Upland, Calif./Yvonne Parker, Bellflower, Calif., 1,109. 3, Joanne Stobbe, Grand Rapids, Mich./Kim Strayer, Wyoming, Mich., 1,087. 4, Jennifer Willett/Andrea Wright, Monticello, Ind., 1,080. 5(tie), Katy Keohen, Eden Prairie, Minn./Stephanie David, Chaska, Minn., and Karen Schmehl, Shiremans Town Wash./Annie Silvers, Spokane, Wash., 1,079. 1, Betty Jean Davis, Herbert Ill./Wendy Mann, South Elgin Ill., 1,098. 2, Judi Ferguson/Melinda Keeney, Pueblo, Colo., 1,076. 3(tie), Margaret DeMoss, Keizer, Ore./Lora Church, Sublimity, Ore., and Erin Diehl/Stephanie Gill, Baltimore, 1,074. 5, Karen Nogle, North Umberland, Pa./Louise Glenn, Greenville, S.C., 1,066. 1, Dianna Kryzer/Heidi Husbyn, Faribault, Minn., 1.035. 2, Geraldine Peterson, Maple Grove, Minn./Jen Abel, Champlin, Minn., 1,009. 3, Julie Clermont/Carol Doutthett, Melbourne, Fla., 1,003. 4. Janette Jones/Tonya Yelton, Casper, Wyo., 1,001. 5, Joyce Baroni, Buena Vista, Colo./Deeann Troutman, Salida, Colo., 995. 1, Lois Davis/Florence Baker, Glendale, Ariz., 971. 2(tie), Carla Bennett/Louanna Bruner, Mount Pleasant, Mich., and Rochelle Roller, Edgerton, Wis./Kris Lamb, Fort Atkinson, Wis., 940. 4, Joan Archer, Farmington, Utah/Sandra Orchard, Kaysville, Utah, 926. 5, Jean Hall, Elkton, Md./Joeia Moore, North East, Md., 919. 1, Debbie Allen/Yvonne Quintanilla, Portland, Texas, 866. 2, Sandy Acevedo, Greeley, Colo./Saffini Wilson, Fort Collins, Colo., 854. 3, Jan Matherly, Pilot Hill, Calif./Merla Rogers, Gilroy, Calif., 829. 4, Laura Paxton/Kathy Evans, Clinton, Ill., 827. 5, Mallorie Gates, Burlington, Iowa/O’Kemm Dixon, Carman, Ill., 822. 1, Taylor Bulthuis, Coral Springs, Fla., 746. 2, Julie Oczepek, Grand Rapids, Mich., 713. 3, Lynda Barnes, Double Oak, Texas, 704. 4, Rocio Restrepo, Louisville, Ohio, 702. 5, Jodi Woessner, Oregon, Ohio, 699. 1, Tashia Blue, Hamilton, Ohio, 653. 2, Janelle Dowling, Loveland, Colo., 619. 3, Stephanie David, Chaska, Minn., 615. 4, Lisa Hutchinson, Novato, Calif, 606. 5, Ruth Ann Barthenheier, Menomonee Falls, Wis., 605. 1, Melanie Prough, Newman Ga., 608. 2, Loretta Tollin, St. Paul, Minn., 603. 3, Barbara Jackson, Norfolk, Neb., 586. 4, Rhonda Acitelli, Villa Park, Ill., 568. 5, Lynn Watkins, North Fort Myers, Fla., 567. 1, Memorial Pritchett, LaGrange, Ga., 644. 2, Kate Dyer, Decatur, Ind., 582. 3, Pam Neil, Virginia Beach, Va., 572. 4, Roberta Swinson, Rhodes, Mich., 567. 5, Tracy Wright, Big Rapids, Mich., 563. 1, Ashley Guzman, Waukegan, Ill., 530. 2, Jacqulyn Schnapp, Arlington, Ohio, 521. 3. Jillian Schneider, Beavercreek, Ohio, 519. 4, Sandra Whitehead, Lansing, Mich., 514. 5, Gracie Aiken, Independence, Kan., 507. 1, Alissa Ebneter, Belle Plaine, Minn., 518. 2, Wanda Cummings, Lincoln, Neb., 467. 3, Deborah Short, Clover, S.C. 463. 4(tie), Barb King, Fort Collins, Colo., and Suzanne Lanz, Janesville, Wis., 462. 1, Jennifer King, Irmo, S.C., 2,046. 2, Shannon Pluhowsky, Dayton, Ohio, 2,027. 3, Katelyn Simpson, Emmett, Idaho, 2,026. 4, Jodi Woessner, Oregon, Ohio, 2,013. 5, Lynda Barnes, Double Oak, Texas, 2,009. 1, Stephanie Gill, Baltimore, 1,785. 2, Stephanie David, Chaska, Minn., 1,763. 3, Renzie Kintzler, Cheyenne, Wyo., 1,707. 4, Wendy Mann, South Elgin, Ill., 1,688. 5, Stacy McCarron, Rockford, Mich., 1,670. 1, Rhonda Acitelli, Villa Park, Ill., 1,737. 2, Melinda Keeney, Pueblo, Colo., 1,660. 3, Barbara Crum, Fort Wright, Ky., 1,642. 4, Belinda Simpkins, Ennis, Texas, 1,624. 5, Jacqueline Derner, Cleveland, Minn., 1,621. 1, Tara Long, Kenton, Ohio, 1,616. 2, Pam Neil, Virginia Beach, Va., 1,574. 3, Tracey Avery, Dameron, Md., 1,550. 4, Donna Penty, Canada, 1,545. 5, Brittney Campione, Monee, Ill., 1,535. 1, Robin Miles, Alberta, Minn., 1,481. 2(tie), Karen Schmehl, Shiremans Town, Wash., and Randi Buseman, Wellsburg, Iowa, 1,458. 4, Vickie Hensley, Mineral Wells, Texas, 1,454. 5, Jacqulyn Schnapp, Arlington, Ohio, 1,434. 1, Sandra Orchard, Kaysville, Utah, 1,312. 2, Bonnie Ryan, Price, Utah, 1,301. 3, Katie Mills, Jacksonville, Fla., 1,291. 4, Julia Lee, Sierra Vista, Ariz., 1,278. 5, Simonne Haas, Mabank, Texas, 1,264.